Airbus Helicopters Inc. recognizes leaders of the air medical transport industry for their far-reaching efforts to strengthen safety and service for crews and patients. 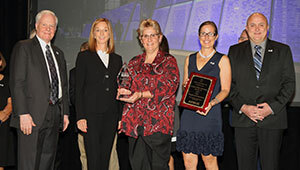 Jennifer Hardcastle, Air Medical Sales manager for Airbus Helicopters Inc., presented the awards at the Air Medical Transport Conference in Phoenix, AZ. Penn State Health Life Lion is the recipient of the 2018 Vision Zero Aviation Safety Award for its development and deployment of initiatives to mitigate the risk of wildlife and drone strikes. Created by Airbus Helicopters Inc. in 2007, the Vision Zero Award recognizes a program or company that has demonstrated a commitment to aviation safety, spotlights specific safety initiatives and encourages the sharing of ideas so others in the industry may learn from them. An industry committee judges the competition. Life Lion leaders studied bird and drone strikes and deployed both educational and technological initiatives within its own organization to avoid such strikes. Leaders created and distributed training materials to increase awareness. The air medical service, which was awarded a $10,000 check from Airbus Helicopters Inc., plans to use the money to expand its bird- and drone-strike technology, purchase new fire-retardant vests and jackets, and provide crash-survival training for ground emergency trainers. Stacy Wolf, in her former role as chief flight paramedic and clinical base manager for Haiti Air Ambulance—the country’s first air medical service—received the Jim Charlson Aviation Safety Award, which is presented annually to an individual who has made significant contributions promoting aviation safety within the air medical transport community. Wolf launched safety training and protocols for crews with no previous air medical transport experience; established safety transport standards in clinics, hospitals and missions throughout the country; and organized an exchange program between the Haitian crew and a highly regarded U.S. flight program. Her efforts have helped ensure that the company has seen no accidents in its four years of existence. Wolf worked for Haiti Air Ambulance from 2015 to March 2018 and now works for the Maryland State Police Aviation Command. She is also chairperson of the Association of Air Medical Services Vision Zero initiative, which works to build a community culture of safety. Carilion Clinic Life-Guard of Roanoke, VA, was named Program of the Year. The award is given each year to an emergency medical services program that has demonstrated superior levels of safety consciousness, patient care, quality leadership and community and industry service. Founded in 1981 as the first air medical service in Virginia, Carilion Clinic Life-Guard is highly involved with its community through organizations such as the Special Olympics and Habitat for Humanity, and has even partnered with Haiti Air Ambulance, inviting members of their crew to Virginia to participate in an exchange program since 2016. They also manage the Rotor Run 5K, with proceeds contributing to a scholarship for nursing and paramedic students. Life-Guard also demonstrates courage through its efforts to safely integrate unmanned aerial vehicles with helicopter EMS programs. To increase awareness, Life-Guard launched the “Land the Drone” campaign and is now working to affect change through legislation and education. Visit Airbus Helicopters at Booth #429 at the 2018 Air Medical Transport Conference in Phoenix, AZ, and follow @AirbusHC_USA for more news and updates from the show.